My late grandfather used to get up at 5am every day for breakfast at a nearby coffeeshop in Sitiawan. He would buy some pau back home for my breakfast but more often than not, I would only eat it at noon – that’s usually the time I wake up, involuntarily. In KL, I can never fathom how some people can have their breakfast as early as 6am. My only exception for breakfast this early is when my night out ends at 5am. rif and I were up at 6am one weekend to send my parents to KL Sentral for their trip abroad, so we decided to revisit the Imbi Market. 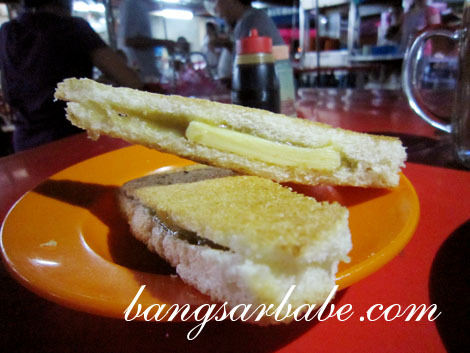 It’s been 8 years since we last visited this market and I could vaguely remember how the kaya toast was. Check out the generous slab of butter! At 6.30am, the place was dark with market vendors setting up their stalls. With my smatter of Cantonese, I ordered a set of kaya and butter toast, two portions of steamed bread with butter and kaya and Hainan tea. The toast – thinly sliced and crisply toasted – came with a thick slab of cold butter and generous slathers of kaya. Crumbly, light and still as good as I remembered it to be. 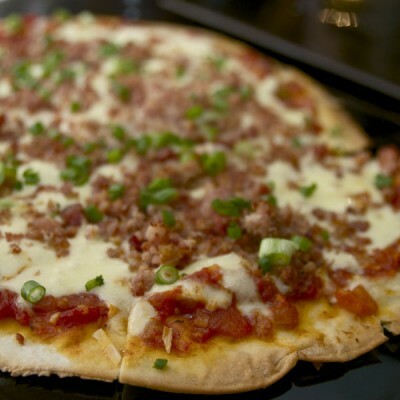 rif preferred the steamed bread for its softer and fluffier texture. This had more bite compared to the crumbly nature of the toast and was just as tasty. The Hainan tea however, wasn’t thick, aromatic or sweet enough. Quite disappointing, this one. I’m not sure how much each item was, but we paid slightly over RM8 for the above. 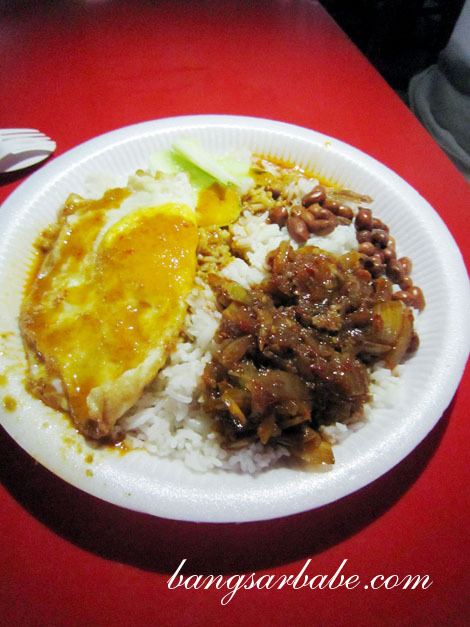 The Chinese style nasi lemak was alright. I’m generally not a fan of Chinese nasi lemak because the rice lacks coconut milk and the sambal isn’t spicy enough. This sambal was VERY spicy but the rice was hardly lemak. I also thought the sambal tasted very one-note. The curry wantan mee stall was quite popular so I ordered a bowl (RM4.50) to try. It was nothing to shout about. While the noodles were toothsome, the broth was quite bland and watery. On the bright side, the cockles were plump, slightly bloody and fresh. 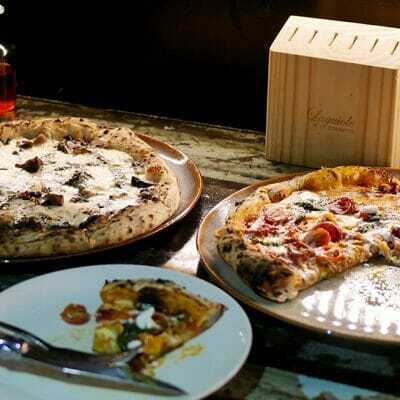 Verdict: If you’re an early bird, check out the food stalls here. I think the earliest breakfast for me is 6am..
As for normal weekend .. I could get up early .. but as for weekday I try to lazy on my bed until the last minute.. 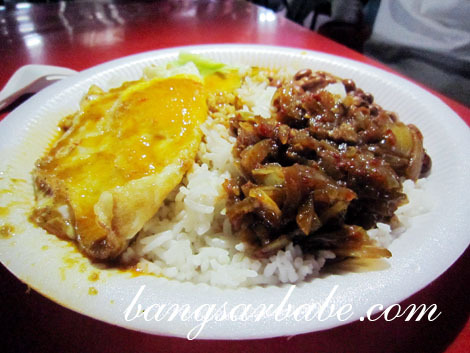 I love chinese nasi lemak.. especially the wild boar rendang curry . 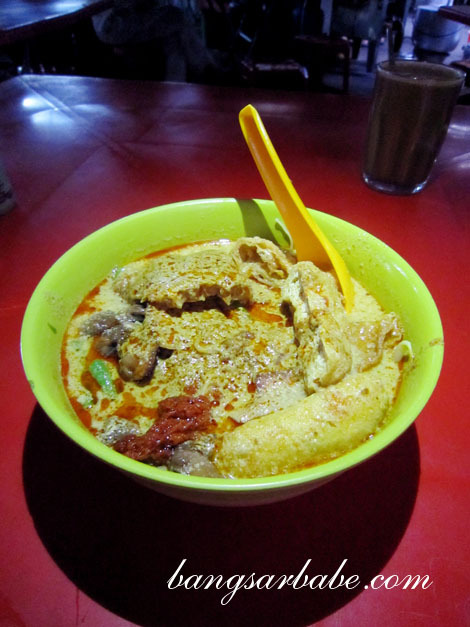 it is good..
normally I will buy a normal chinese nasi lemak and then I add in siu yuk ..
Hahaha…sometimes only la. Oooooh….nasi lemak with siu yuk?? Sounds damn nice wei! If only they open for dinner! One of my weekly brekkie places since its on the way to my office. You must try the mince meat noodles. The first stall as you walk to ah weng’s. the chee cheong fun is also good! 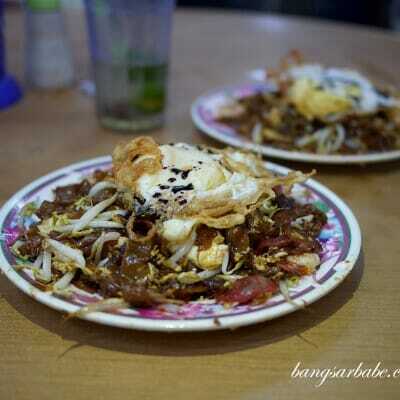 and if you check out the uncles CKT, its old fashion style with lots of black pepper. 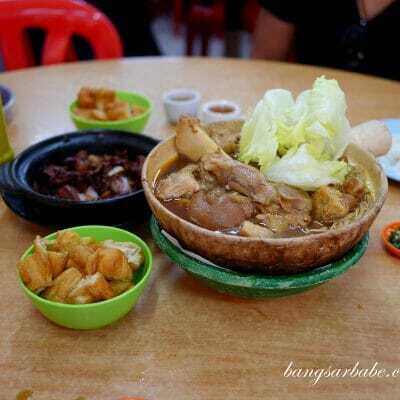 This place used to serve very yummy pork intestine porridge. But I don’t see uncle there anymore. Sadly I’m always up by 6am. Not by choice. Would love to get up with the sun if possible. I like this type of toast. just as what you’ve describe. 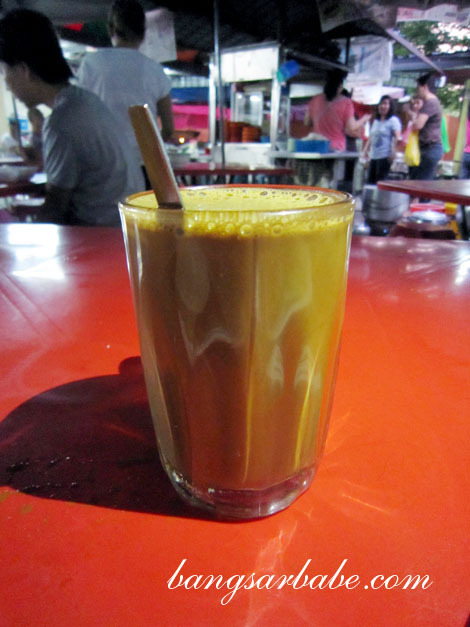 – a thick slab of cold butter and generous slathers of kaya!! Goes perfectly with black coffee! Aww, the Curry Noodles wasn’t good? 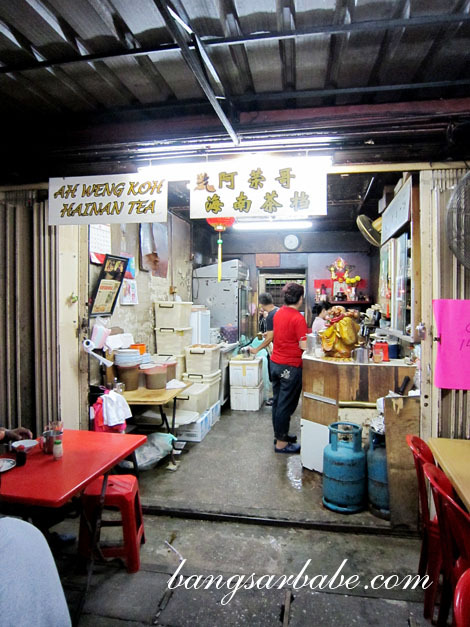 I used to like it a lot, haven’t been there for more than 10 years, it used to be my breakfast place with my mum during primary school, nostalgic! Haha, will revisit when I wake up early next time. I come here almost every Friday to have my kopi fix! 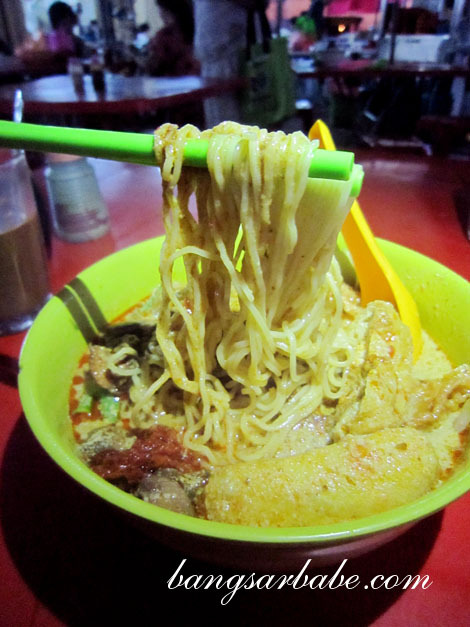 I love their wan tan mee and chee chong fun stall. I heard that the market will be closed soon for development.